"Welcome to the home of Florida's #1 hurling club"
To conserve club funds we also stopped the $5 p/mo feature that prevents popups on this site. Uggh! Def visit our GAA sponsored site- no popups there. While our current site will be maintained and update, we will be transitioning to the new site in the coming month. This grant is a great opportunity for new clubs so if you're starting one, for more information. 9/6/09 Thank you all for making our first raffle a success. 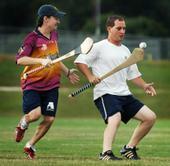 With all of you visitors and locals standing behind us, there will be no stopping hurling in Florida. Please visit our page if we met you today but didn't take your phone number/email address. It's the Irish sport that doesn't involve drinking too much beer. Like our brethren, "First we hurl, THEN we drink!" Whether you're in it for recreation or competition, hurling is a fantastic sport and you have to try it at least once in your life. Come on out, meet new people, and give it a try. All levels of fitness are welcome. It's a great "something new" activity to share with your kids as well. Visiting this site for the first time and haven't seen a hurling match? Be sure to , prepared by Eamonn Gormley of the San Francisco Gaelic Athletic Association. If you liked what you've seen, then visit for the best videos and coverage. Just visiting town and want to see a match on Setanta? Call/visit The Lucky Leprechaun on International Drive. Click and contact info and . Promoting all things celtic, the Orlando Chapter of the New World Celts meets the 2nd Thursday of every month at 7:30pm at "The Claddagh Cottage" 4308 Curry Ford Rd. Orlando 32806, 407-895-1555. Gotta give it a try but don't want the pressure of meeting in a group? Email/call Scott. Your puck-outs will be kept strictly confidential. 08:30 Sunday 8/23 Assemble in first parking lot on left. 09:30 Sunday 8/30 Assemble in first parking lot on left. * It's brutal hot. We deserve air-conditioned comfort. 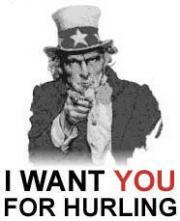 Call for the televised Setanta Premium hurling/football schedule. I'll do my best to post the same. There's wall ball at the break (please don't take out the satellite dish), and there is a field within staggering distance of the pub (end of Carrier Dr.). Seriously though, skills can be learned in a parking lot. Just limit yer pints. Note that the North American GAA Championship fixtures may change, but the dates remain the same. Hurling has been described variously as 'field hockey in the air,' 'brutal field hockey,' 'like lacrosse but with solid sticks' etc. None of these descriptions really do the game justice. To truly get a feel for the spirit of the sport requires that you see it in action. It exhibits a unique combination of skill, athleticism, stamina and speed that few sports can match. It is acknowledged as the fastest field game on earth. It has the speed and continuous flowing action of ice hockey but on grass. It is played with a long curved stick similar to a field hockey stick but with a broader and flat end which allows the player to control the ball in the air as well as on the ground. It is made of ashwood which has just the right properties that allow the stick to flex up to a certain point. The end (the boss) is usually slightly bigger on a goalkeeper's stick. 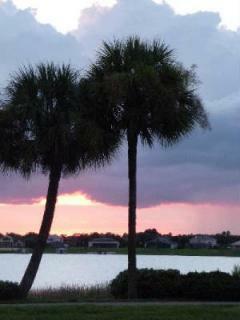 But the best thing about hurling is that you can play it in Orlando! If you're at this site, then you've probably been singled out by our selectors as having the right stuff for hurling (a heartbeat, reckless abandon, strong legs, some teeth, otherwise savage good looks.) Next, click on ol' Uncle Sam to learn how to enlist (err, join). to read there article in the Augusta Chronicle.